Now that production is fully underway, TKO Libations of Lewisville is ready to celebrate its official grand opening with an event set for Saturday, January 13. Gingerbread Monster - gingerbread porter brewed with toasted ginger, cinnamon, nutmeg and cloves. Breakfast Stout at Tiffany's - breakfast stout brewed with oatmeal, locally-roasted coffee, cocoa and strawberries. You Like the Juice - a hazy, New England IPA that looks, tastes and smells like a glass of fresh-squeezed juice. Additional selections: Tart Blonde, Special Beast (special bitter), Abbey Delight (Belgian dark strong ale), Bayern Weizen (Bavarian wheat), Southern English Brown Ale, Dry Stout and Oatmeal Stout. 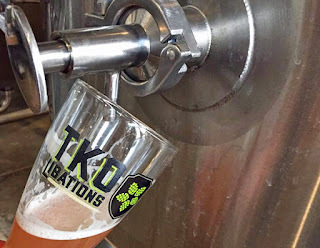 Located in the Castle Hills Village Shops development, TKO occupies a 2800 square foot space comprising an indoor bar, seating areas with games and televisions, an outdoor patio and a separate brewery space with windows to view the operation. As for the event itself, a morning Zumba session in the Village Shops’ outdoor Plaza will kick off the day's festivities, with TKO set to open its doors at 11 a.m. for “Donuts and Beer." Then, throughout the day, the event will feature a variety of family-friendly activities like face-painting and balloon animals, as well as live music from from Storm Front and Ross Redmond of High Definition. Food options will be provided by the Walt Garrison BBQ Food Truck, though customers may also bring in items from neighboring restaurants, either by way of takeout or delivery. One Village Shops vendor, The Salty Cow Cheese & Provisions, will offer a special cheese plate to attendees in honor of the occasion. Details and a complete schedule of events will be posted as the event draws near, so be sure to keep up with TKO's social media channels for the most up-to-date information.